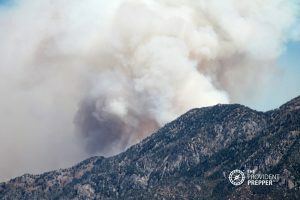 A wildfire is blazing just over the mountain from us and many citizens are under evacuation and pre-evacuation orders. A disaster threatening just around the corner motivated me to check our emergency preparations to make sure we are ready for any emergency. How will I cook without electricity or natural gas to power my appliances? The options are surprisingly exciting including canned heat and my wood burning stove for indoor use. Dutch ovens, charcoal ovens, propane barbecue and grills, rocket stoves, campfires and solar cookers are all fun ways to manage disaster cooking outdoors. These alternative cooking methods sound more like the makings of a party in the making than a disaster. Each cooking option possesses unique limitations, but with this fantastic variety, I will be able to cook our dinner come what may. Every emergency situation and environment is a bit unique. 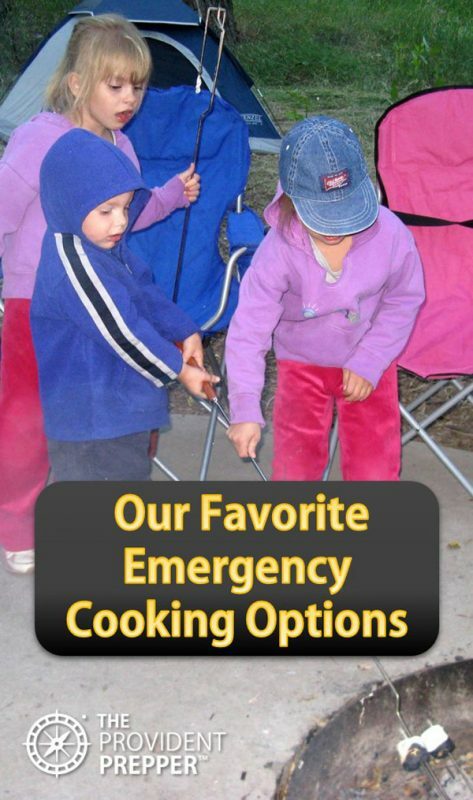 When disaster strikes, it is the perfect time to break out the cooking toys and party! Today we share our favorite alternative cooking options. Most fuels can’t be safely used indoors. Please remember to always use extreme caution when cooking indoors to prevent carbon monoxide from building up in your home and making everyone sick … or even worse. Take a minute to review our post on Safe Indoor Emergency Cooking Solutions to learn the intricacies and safety considerations of cooking indoors during an emergency. 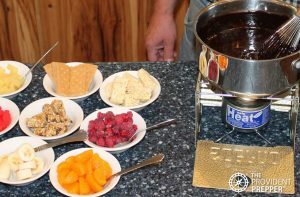 The power flickers out and the first thing that comes to mind is “Chocolate Fondue Party!” The kids run for the flashlight and rummage through the fruit bowl and pantry while I retrieve the folding camp stove, canned heat and lighter. Within just a few minutes, we are sitting around the tiny warm stove in the dark indulging in just about everything dipped in warm chocolate. The small disposable cans of fuel can also heat up canned soups, scramble eggs or boil water. But it just isn’t an adventure without chocolate! My absolute favorite winter hangout is in front of our wood-burning cook stove. In our climate, cooking on the wood-burning stove is only a viable option for about half of the year. But when it is cold, it is the perfect solution for heating and cooking if the power is out. We have a Heartland Sweetheart Wood Cook Stove with a 5-gallon water reservoir. 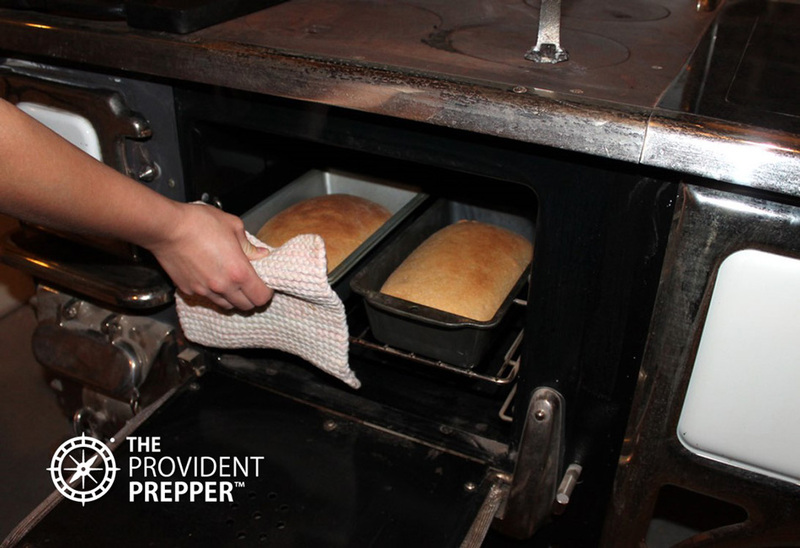 The oven is ideal for baking and the reservoir humidifies the air and keeps us in hot water. There are many great wood-burning cook stove options available. Our goal is to be able to live comfortably without electricity or natural gas and this stove enables us to achieve that goal quite nicely. I have a collection of beautiful cast iron cookware that simplifies cooking on a wood stove. Breads, casseroles and desserts fill the house with delicious smells while baking. I can put a pot of stew on and let it slow cook all day long or flip a pile hot pancakes for breakfast. I have even bottled a batch of applesauce from simmering the apples to processing the bottles on my stove. It is definitely more work that on my standard stove, but I am now confident that I can cook just about anything on this stove. A pile of split wood is stacked in the yard and a small rack is kept indoors near the stove to ensure that we always have dry, seasoned wood for our fires. We are ready! 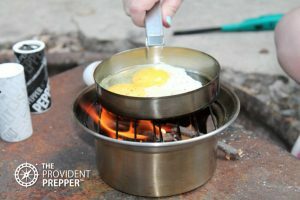 The great thing about outdoor emergency cooking options are that they can be used in everyday life to add beauty and adventure to entertaining, and they are your faithful friend when times get a bit tough. Practicing and perfecting your outdoor cooking skills will surely reduce a bit of the stress surrounding a crisis. Sounds like a great excuse for a barbecue! Be sure that you have safely stored enough fuel to get you through any disaster scenario. Check out How to Store Fuel Safety for Emergencies for some important safety tips so you don’t blow up your family. Charcoal briquettes are one of the least expensive fuels (per BTU) you can buy. They store safely, but must NEVER be burned indoors! Charcoal consumes a tremendous amount of oxygen and produces a vast amount of carbon monoxide, a deadly poison. A charcoal chimney is an excellent tool to start charcoal. Remember to store matches and newspapers or lighter fluid to start the charcoal. I like to tuck a lit can of canned heat under the charcoal chimney to start the charcoal. No blowing, no mess … just hot charcoals in a few minutes. We use this inexpensive homemade creation to bake foods in a 9”x 13” pan or on a cookie sheet using charcoals. I have baked frozen lasagnas, cakes, cookies, casseroles … almost anything you can bake in your standard oven, except perhaps something very large like a turkey. You can find our step-by-step illustrated instructions to make an Apple Box Charcoal Reflector Oven here. Baking temperature may be controlled by using one coal for about every 35 degrees desired. The oven will maintain temperature for 45-55 minutes. Slip fresh coals underneath as needed for longer cooking times. Similar to the apple box oven, this homemade oven is just big enough to accommodate a 9 x 13 pan and is made using a box which contained reams of letter size paper. The design is unique as the charcoals sit inside the box, just off of the surface on an inverted baking sheet. This box is smaller and more efficient, requiring less coals to cook the same amount of food. See detailed instructions on how to make and use your Paper Box Oven here. 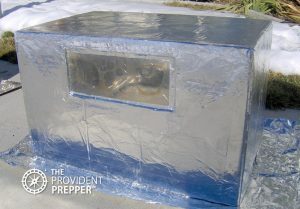 The Paper Box Reflector Oven requires only 8-10 briquettes to bake for 60-75 minutes at about 350°. Start coals and place hot coals evenly on the inverted baking sheet on the bottom of the oven. Place the food in a pan on foil-covered dowels (a 9″ x 13” pan fits perfectly) and cover with the lid to bake. We love the way that a Dutch oven, cake mix, cube of butter and a can of soda can turn a 12 year-old boy into a master chef. Everything tastes just a little bit better when cooked in a Dutch oven. We can use our Dutch oven with a few charcoal briquettes or over coals on an open fire. It is a highly versatile tool for creating delicious meals. We frequently use our Volcano in combination with Dutch ovens because it increases the efficiency of our Dutch ovens as the airflow is regulated and the heat flow is channeled to the sides of the pot. That means we use about one-third less fuel to bake that delicious dinner. The Volcano can also double as a portable fire pit. The fire is kept off of the ground and contained. Sometimes it is nice to have a safe campfire for comfort, cooking or lighting up a dark night. Propane cylinders fuel many of our favorite backyard and camping favorites. Many backyards boast a nice propane barbecue for delicious Sunday dinners and other gatherings. Remember to keep your cylinders full so that when disaster strikes life can be like a Sunday afternoon get-together. One of my all-time favorite propane cooking devices is my dearly used and abused Camp Chef. It has a seasonal home on my back patio all spring, summer and fall when it is too hot to cook indoors. I do all of my canning and processing on the propane stove so that both the heat and the mess stay outside. 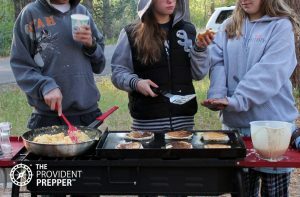 The gas grill goes camping with us to provide hot breakfast to lots of hungry campers on a chilly morning. I love the instant hot fire that never fails, even when the weather is below freezing. Every backyard needs a propane barbecue to liven up dinnertime or for entertaining family and friends. 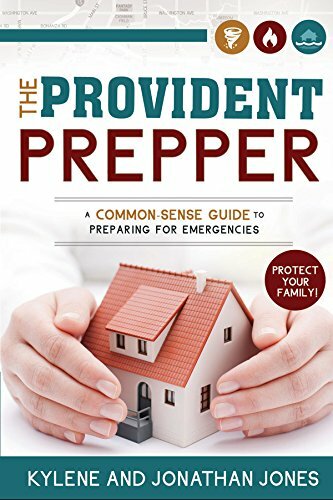 As long as you have full bottles of propane, your backyard barbeque can be a valuable emergency preparedness tool. Make sure that you purchase a style of propane barbecue which has at least one side burner to diversify your ability to cook. You need to boil as well as grill or bake. One simple burner can make all the difference when it comes to cooking in a crisis. The lightweight, portable nature of the propane stove is fantastic for outdoor cooking. You can just set this little stove on top of a picnic table and start cooking. 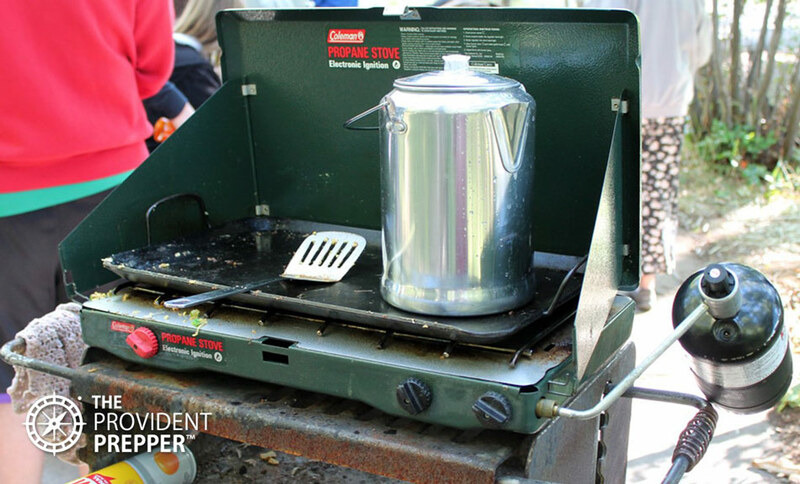 The cooking space on a portable propane stove is much smaller than 2, 3 or 4 burning gas stoves that are available. Because it is not large and cumbersome, it is very easy to pack up and take with you if you need to evacuate. Same great benefits of propane in a small, portable package. Solar energy is a great fuel source. It is free, abundant and relatively safe. 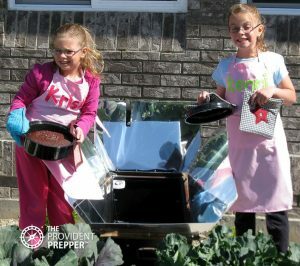 Successful solar cooking takes a little bit of advanced planning. Optimal solar cooking usually occurs between 10 a.m. and 4 p.m. A great way to determine if it is a good day for solar cooking is to check the UV index. 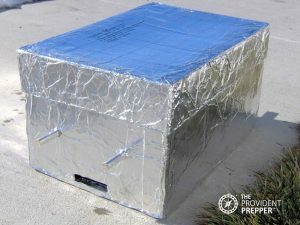 A UV of 7 or higher is perfect for solar cooking. Enter your zip code or location in the little widget below to see the current UV index near you. No computer, no problem. Does today look like you may be at risk of getting a nasty sunburn? Then it is a perfect day for solar cooking. You can still use a solar oven on less-than-perfect days. Just expect the food to take a little longer to cook. I own a couple of different solar ovens and so far the Global Sun Oven is my favorite. It still fascinates me every time I put a cold pot of something in the sun oven and come back an hour later to find it hot and ready to eat. It takes a bit of practice to get good at solar cooking. Some days it is pretty much impossible to use a solar oven due to the weather. The wind in our area requires a bit of unique adaptation to keep the oven from blowing away. I use the solar oven whenever I can. No mess, no smoke, no over cooking, no tending … it is just a great way to take advantage of an unlimited fuel supply..
Wood (or debris) is a great option for everyday cooking as well as in emergency situations. It is one of the least expensive and safest fuels to store. Disasters often produce debris which may be collected and burned. Use caution and be sure any debris you choose to burn is free from substances which might release toxins into the air such as paint or plastics. We already discussed my fabulous wood-burning cook stove for indoor use, now let’s check out some of our favorite outdoor wood-burning options. These stoves will burn wood, charcoal or any flammable biomass material for fuel. The fuel is fed into the stove through a small door at the base and the pot sits on the top. The chimney effect creates a nice hot fire using minimal fuel. The only drawback is that it requires fairly continuous tending to keep fuel fed into the stove. Plans for homemade versions are available on the internet. We were introduced to the Kelly Kettle a few weeks ago and discovered that it is wonderful little stove to burn small sticks, pine cones and other small debris. 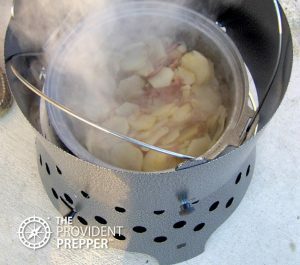 It works wonderfully well to boil water as well as cook individual size servings on the grill or hot plate at the base. Larger rocket stoves are a better choice for feeding a family. One thing to note is that the children love to play with the lit ends of the sticks. While this may be a great activity, it is extremely dangerous. Children are drawn to fire and things that glow. A good old campfire promises endless possibilities for fun and excitement. 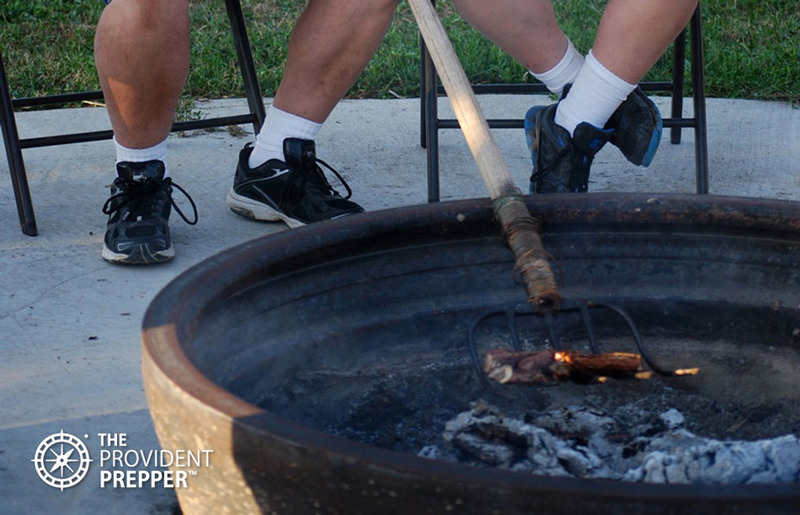 As demonstrated in the photo, all you really need is a campfire and a pitchfork or a shovel to make a delicious meal. Note: Jonathan not a fan of frying a steak on a pitchfork that was used to turn manure. He prefers to use a clean portable grill over the top of the coals. A portable campfire grill placed over a fire can provide a stable cooking area and make a campfire just a little more versatile. We love to use sticks or roasting forks to roast marshmallows, hot dogs or, our favorite, Starbursts. There you have it. The Jones alternative cooking method we may choose for any disaster depends on a variety of factors. Is it safe or comfortable to cook outdoors? What fuels do I have available to use? Are there dangers that need to be taken into consideration? Do we need to do something fun to comfort frightened children? 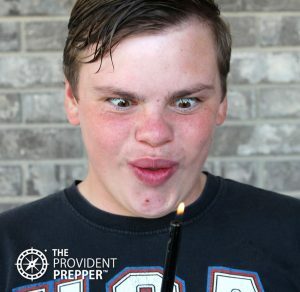 There are a hundred important things to consider before you ever light a match in an emergency. I am not insinuating that we should take everything lightly. You will know when it is time to be serious and when it is time to play. The disaster is going to run its course whether or not you are miserable. Choose not! Remember to make your life into a grand adventure. Take a deep breath. Tackle one challenge at a time. Be willing to help and share what you have with others. Smile! Take time to laugh and discover the humor in life’s challenges. There may be a lot of things which are out of your control, but your ability to control your attitude is yours. Let your happy attitude shine through the smoky clouds of disaster and be a light for others.